The Kiama Alpine Club was the dream of a Ukrainian migrant couple, Eugene and Lala Baranowsky, who arrived in Australia in 1951. Eugene, a veterinary surgeon, found work in the Kiama area where the couple settled. Before long, they were able to think of skiing again as they had in Europe, and to begin planning to build a small lodge in the Snowy Mountains with some of their friends. At Easter 1957, on a visit to the fledgling village of Thredbo, they found a lot and placed a deposit of £50 (in today’s terms nearly $1500) on it. Unable to convince their migrant friends of the worth of the venture – many were not yet well established in Australia – they turned to the farming and small-town communities south of Wollongong for the support needed to bring the project to fruition. Before long a club had been formed, local people were joining it and paying debentures to fund the purchase of the lease and the construction of a 12-bed lodge, and Eugene had become club captain and ski instructor for people who had never before seen snow. Thus was a club born that would never have come into existence without the vision and commitment of two newcomers to Australia. The Kiama Alpine Club’s story is not unlike those of many of the other ski clubs in Thredbo. It encompasses disaster (the partial destruction of the lodge in 1968 when a hot water system exploded), a number of rebuildings to a larger scale and greater level of comfort, the passing of most of the founding members, a reorganisation from sporting club to cooperative, a considerable growth in membership and much input by way of working bees to maintain and develop the lodge, the carpark and the surrounds. Many leaders made all this possible, among them the Baranowskys, Howard Waters, Alan Fredericks and several others. Fredericks was the club’s president for 25 years, handing over the reins in 2010 to Liz Wynn who had for several years held the position of club secretary. There have been trials and challenges along the way, including the loss of some funds when the Australian Association of Co-operatives went into liquidation in 1993, but the club’s story has been overwhelmingly a positive one. 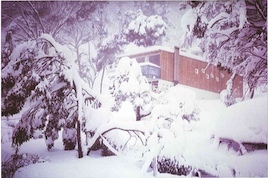 It participated in the FIS Men’s World Cup in 1989, making accommodation available for officials and its own members taking part during the event in the world’s longest flare run, and in 1997 it provided accommodation for emergency responders after the tragic landslide which wiped out two lodges and killed 18 members of the Thredbo community. In 2003 the lodge had to be evacuated, along with the rest of the village, when the worst bush fire in Thredbo’s history threatened. Such alarms notwithstanding, the club prospered and celebrated its first 50 years in 2008 with further extensions to its lodge (which now contains 30 beds), the modernisation of its dining area and kitchen and the production of an historical DVD. Eleven years before, the club had produced a book on its evolution and activities. It celebrated Thredbo’s half-century too, donating a commemorative seat on the golf course. In 2011 the membership exceeds 350 and the club has grown well beyond its original Kiama base. Along the way it has produced several fine skiers and snowboarders.